I provide a proof that alternative energy production technologies (wind, solar, ocean energy, biofuels, etc.) necessarily burn more fossil fuel, per quantum of energy generated, than the energy production technologies that directly burn fossil fuel. If this were not the case, or if there was a realistic potential for this not to be the case, then alternatives could be more economical on a true-coast basis and would be experiencing a consequential surge in development and implementation, without disproportionate (per energy quantum) public investment. The increases in the insignificant alternatives are tied to disproportionate government investment, incentives, and subsidies, which transfer artificially high costs to citizens and users. As soon as government commitments are reduced or terminated the sector crashes . Here is the said proof. The true (no public subsidy) cost of any "alternative" is a fair proportional measure of the fossil-fuel expenditure needed to create and maintain the said "alternative". This is true because a large fraction of the said true cost is to buy the mechanical (machine) work to entirely manufacture and maintain the alternative technology. The said mechanical work is needed for every aspect of the production, from mining and transporting ore (or raw material), to making materials from the ore, to making components from the materials, to assembly of the components, to computer design (having built the computers), to feeding and clothing and housing and transporting all the workers involved... (i.e. labour costs), to installing the technology, and to maintain the technology. Operational life-time and disaster installation-replacement must also be counted, as part of "maintenance". The required said mechanical work is energized by the available energy sources. Since 87% or so of energy used, which powers all machine activity, is fossil fuel (not to mention hydro and nuclear), therefore the said mechanical work is mostly energized by burning fossil fuel. 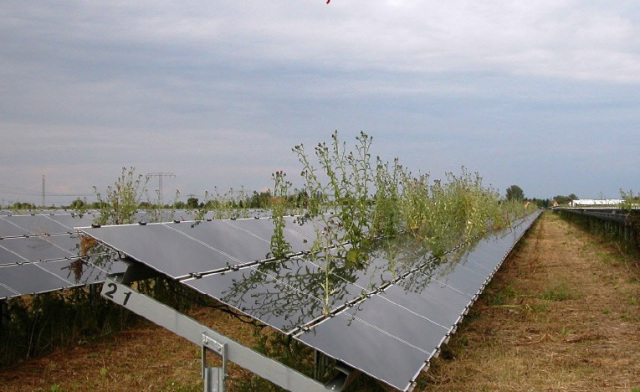 Since the true cost of alternative energy produced is higher than the true cost of fossil fuel energy produced, since true cost is a measure of available energy consumed in producing the energy, and since available energy is mostly (87%) from fossil fuels, it follows that alternative technologies burn more fossil fuel than the fossil fuel technologies themselves, per quantum of energy produced. This is not surprising since virtually all human-directed work performed on the planet (to build and maintain everything), beyond the small contribution of work directly from human and domestic-animal muscle power, is energized by conventional high-density energy sources. Every societal transformation imaginable, from growing food to building cities to transportation... uses concentrated and transportable energy. Inescapably, alternatives burn more fossil fuel than conventional energy. This will be true until the high costs in energy for total-cycle manufacturing and maintaining of alternatives is paid for using energy produced by alternatives. The above proof relies on the link between true cost and underlying full-process energy consumption. The said link is a reality. Without energy to perform work, raw resources are useless and do not become technology. The above proof is compelling enough that anyone who alleges having found specific circumstances in which a particular alternative technology does not burn more fossil fuel than fossil fuel technology, per quantum of energy produced, should have the onus to prove the alleged exception resulting from the exceptional circumstances. That discovery and demonstration of principle will not need government subsidies. E.g. : "UK solar power installations plummet after government cuts", The Guardian, April 8, 2016; "EY report : Attractiveness of UK renewables plummets as government withdraws support earlier than expected", EY.com, September 16, 2015. There is a reason you have garnered zero comments or interest. If the entire sub-continent of Australia was covered with P.V. solar panels, every square inch of it, the whole population moved off shore, there would not be enough electricity produced to keep the lights on, let alone re-charging all the battery run devices that today's society must have. No cell phones. No portable computer devices. No heating. No A.C. No TV. No radio communication with aircraft. Just candles. Excellent post by Denis Rancourt. It would be great if "renewables" worked as well as all the optimistic imaginings. But real-life intrudes. So, what's your proof? 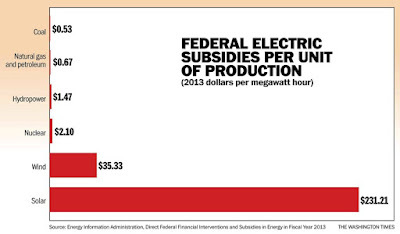 That renewables have some tie to fossil fuels? DUH! What doesn't have a tie? I don't see any facts, just pure conjecture. 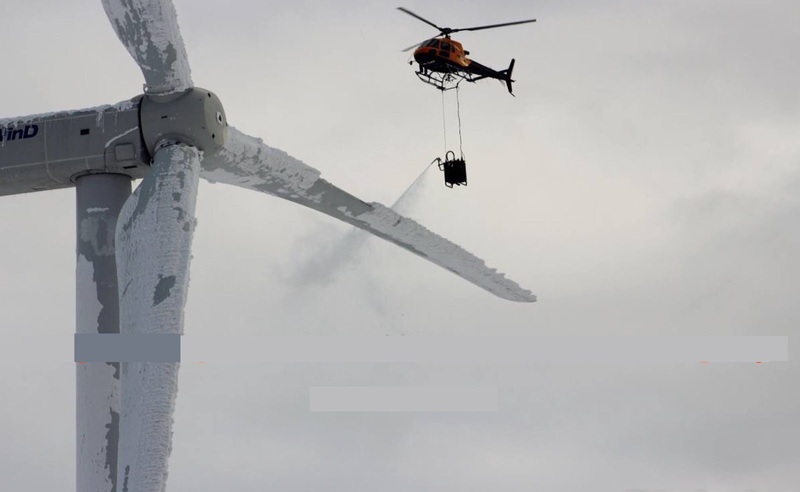 What I want to see is, for the picture showing a turbine being de-iced, the emissions from the de-icing agent as well as the fuel consumed for that job by the helicopter vs. the energy output of the turbine once it was re-started. Same for the solar array. Show me offset emissions vs. what it took for a crew of workers to go through that solar farm and trim back the plant growth. What you'll find is that the renewable energy equipment has offset more energy and carbon than it takes to build and maintain it, by a long shot. Marshall, I find that very hard to believe. You are seriously underestimating solar production (and/or seriously over-estimating energy usage). Covering Australia in PV would power most of the world's societies. In the US, converting the roads to Solar Roadways would provide more electricity than is used. That has been independently verified. A 5 watt solar panel provides more than enough energy to keep a cell phone or two going. A 17 watt solar panel can keep a laptop going (and is about the same size as said laptop). The solar array at my house powers the entire house and two electric cars. That array would easily fit on the roof had I roof-mounted it.